On October 18, 2017, BCONE (the Brownfields Coalition of the Northeast) proudly hosted an informative and insightful presentation on the evolving role environmental insurance is playing in reducing the uncertainties and risk associated with brownfield redevelopment projects. Thanks to our sponsors for the entire event, WCD Group, LLC and Advance Realty. Both groups presented an update on the dynamic environmental insurance market and how insurance is being effectively utilized in brownfield transactions, risk transfer and mitigation, and site remediation. 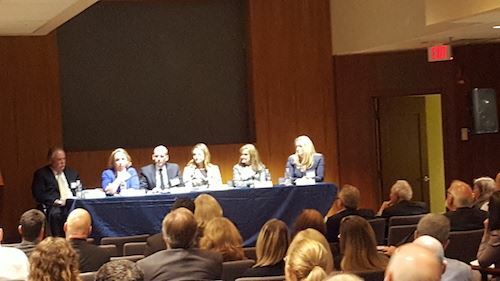 The all-star panel included speakers from Great American Insurance Company, Beazley Insurance, AON Risk Solutions, WCD Group, Advance Realty, and Sills Cummis & Gross PC. This blend of environmental insurance underwriters, brokers, developers, consultants, and attorneys provided different perspectives on why transacting parties need to take advantage of environmental insurance and how it can be a valuable asset throughout the transaction and the life of the property. 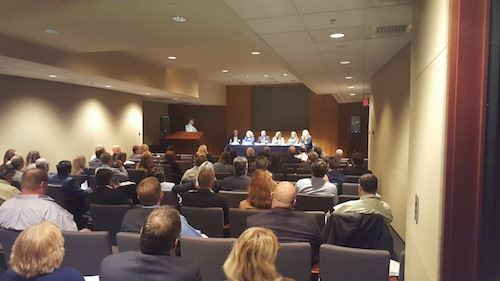 The presentation and networking cocktail event for 100+ attendees, held at the New Jersey Center of Excellence in Bridgewater, also included a discussion on the various types of environmental insurance policies available today, each playing a different role offering complementary coverages at different stages of the transaction and redevelopment process. The lively panel discussions included considerable audience participation, with members of the audience asking specific site issue questions, as well as sharing their professional experiences of how environmental insurance can be used as a tool to help promote the redevelopment of at-risk sites. One audience participant commented that risk quantification is something that is required and often demanded by lending institutions as a condition for investment. It is the basis for understanding the deal and obtaining insurance. All concluded that environmental insurance can be used in facilitating the real estate transaction, bridging the gap between the seller and the buyer. 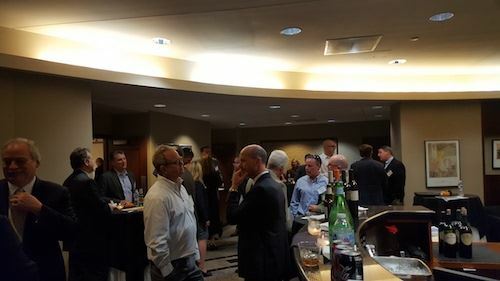 BCONE encourages other companies that provide tools, products and services for brownfield remediation, revitalization and redevelopment projects to reach out to us at sboyle@geiconsultants.com if BCONE can assist you in hosting other informative programs. The WCD Group/Advance Realty model is a great one to follow! If you joined BCONE for the tour of the Kroc Center in Camden last year, you had the opportunity to meet Maria Yglesias and Maria Mar Lopez of M & M Development. BCONE is delighted to see that Maria and Maria are recent recipients of an Extraordinary Women of Achievement award from the Professional Women in Construction – New Jersey Chapter (PWC-NJ). M & M was recognized as the developer and builder of “superior and distinctively beautiful affordable housing.” In their own words, they “pursue excellence” and are “ responsible for transforming communities.” That is one great mission statement! M& M Projects include Coopers Hill Housing Development in Camden and Harmony Square in Newark, NJ. Externally of NJDEP through “out of the box thinking." This is demonstrated through the NJDEP’s desire for more stakeholder input in the regulatory process and a better emphasis toward service to the community. The Eectronic Waste Management Act covers a varied of recyclable products. However, the focal point of the presentation was on the challenges with recycling TVs. The cathode ray tubes (CRTs) in the older TVs contain lead. The last manufacturer using materials from CRTs closed operations; resulting in a “negative value” for the recycling and disposal of CRTs. The e-waste law requires manufacturers of TVs to recycle TVs at no cost to the consumer. In December 2014 NJDEP issued letters to manufactures and recycler facilities of the manufactures reminding them of this obligation. The NJDEP incurs a significant expense administering compliance with the e-waste regulations. Bad “ozone” (O3)which is ozone found on hot summer days at ground level is caused by a photochemical reaction of the sun rays with air pollutants primarily volatile organic compounds and nitrogen oxide (NOx). NOx pollution is emitted by automobiles, power plants, industrial boilers, cement kilns and turbines, and diesel generators. The (O3) air health standard is 85 parts per billion (ppb), but the EPA is looking to lower the standard to 65-75 ppb. O3 was the only air pollutant NJ did not meet last year. However, in determining the NJ air standard compliance, we are lumped in with PA, NY, and CT. PA is upgradient of NJ (prevailing wind direction) and PA allows their coal power plants to periodically shut off/by-pass their air pollution controls. It is during these times of high electrical demand that the NOx emissions climb and NJ cannot meet the O3 health standard of 85 ppb. PA NOx emissions have risen 23% over the past several years, whereas NJ’s NOx emissions have declined. Similarly in NY, companies with larger diesel generators (mobile sources) are paid by the utility suppliers to operate their diesel generators to put power into the grid at high peak demand periods, creating a sudden increase in NOx emissions. In summary, NJ has made strides to reduce NOx emissions and therefore reduce the natural photochemical production of O3 during hot humid summer days; however, we cannot reach 100% compliance with the EPA O3 health standard (current or the proposed lower EPA standards) without cooperation from our upwind neighboring states. Stormwater overhauls for combined sewer overflows (CSO’s) and stormwater MS4 permits. The goal is within the next 10 years to eliminate the CSO’s outfalls; and/or to provide backup treatment to them. NJ is 3rd in solar energy development promoting “net meter” (behind/ after the meter). For power stability NJ needs a significant base of dependable energy power supply like nuclear and natural gas generating plants. Mr. Mark Pedersen Asst. Commissioner provided a brief introduction for Ms. MacGregor and Ms. Hershey. Ms. MacGregor and Ms. Hershey provided updates on the success of the LSRP program and the priorities of the Department to identify and address immediate environmental concerns (IECs). Overall the number of new cases coming in is for the first time lower than the number of cases being closed by LSRPs. The number of IECs identified has been climbing, which is interpreted as more sites are being identified and addressed properly through the LSRP program. This department does much more than just “enforcement." It spends a significant effort on the compliance aspect of the department. The department addresses compliance assistance programs in the areas of UST, air, hazardous waste, solid waste, pesticides, land use and water quality.One example is the $10,000 grant for dry cleaners with the older “PERC” equipment to upgrade to the newer “wet” or “VOC” machines. The grant application period has been extended to 12/15. Other examples include public training the department provides throughout the state for various topics. Ms. Wormley discussed two pieces of field equipment the NJDEP has been able to purchase that assist with compliance and enforcement inspections: the Jerome meter which is used to monitor H2S emissions in the air; and the FLIR infrared camera, which the NJDEP can use to determine if vapors are being emitted and/or if an out-of-service above ground storage tank is actually empty without physically inspecting the tank. All issues are confidential and the program's approach is flexible. The program attempts to help the parties reach a resolution; it cannot bind a party that does not agree with the proposed resolution. The average time frame for resolution is between six to nine months. The program has a 75% success rate of resolving disputes. 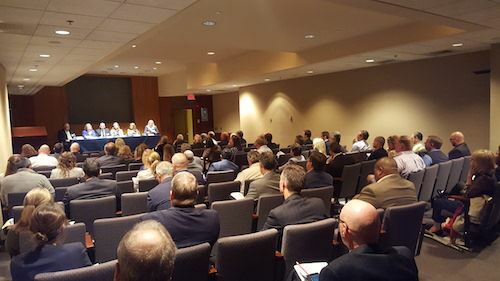 On September 19, 2014, the Brownfield Coalition of the Northeast (BCONE) held an educational event presenting the initial challenges and overall success of brownfield redevelopments in Woodbridge, New Jersey. The event included a morning bus tour of brownfield sites, mostly within the Keasbey Brownfield Development Area (BDA) in Woodbridge, followed by afternoon presentations. Attendees included state officials, developers, attorneys, contractors, consultants, engineers, and other interested parties. Woodbridge Mayor John E. McCormac kicked-off the morning at Hatch Mott MacDonald’s (HMM’s) Iselin, New Jersey Headquarters, by sharing Woodbridge’s commitment to brownfield redevelopment and the benefits it has brought the Township. He described the sites that attendees would learn about over the course of the morning, and premiered Woodbridge’s new Brownfield Documentary. Mayor McCormac has a long and distinguished career in New Jersey, having served most recently on Governor Chris Christie’s Transition Team following the 2009 gubernatorial election. Event attendees then heard from Tony Findley, the New Jersey Department of Environmental Protection (NJDEP) Case Manager for the Keasbey BDA. He spoke on NJDEP’s BDA program and its benefits for site and community redevelopment. Dan Nugent from Competitive Power Ventures, Inc. (CPV) then spoke about the company’s new power plant, which is being constructed on one of Woodbridge’s former brownfield sites and is on schedule to open in December 2015. Caroline Ehrlich, Executive Director of Woodbridge Economic Development, Marta Lefsky, Woodbridge Director of Planning and Development, Matt Mauro, Woodbridge’s LSRP of Excel Environmental Resources, Inc., and Tony Findley then led the bus tour of Woodbridge’s brownfield sites and redevelopments. The first stop was the Woodbridge Community Center, an115,000-square-foot sports and entertainment complex built on a former landfill. Attendees then drove past the Chemtura site before stopping at a brownfield that will soon be the site of Arizona Iced Tea’s bottling plant. The plant will process approximately 1,000 cans of iced tea a minute, and the project is likely to produce over $20 million in revenue to Woodbridge Township over 30 years. The next stop was a site located on the Raritan River in Edison and Woodbridge Townships that was once part of the U.S. Army’s Raritan Arsenal. Wakefern Food Corporation, the largest retailer-owned cooperative in the U.S., has since redeveloped the site into a distribution center. Wakefern’s distribution facility ships more than 1.5 million cases of product each week for all ShopRite and PriceRite stores. Also, on the same property, a FedEx Ground distribution center has also been constructed. Both of these projects are PILOT projects that have and continue to provide significant funding for Township projects, programs, and events. Next up on the tour was the 185-acre former Nuodex Corporation site, which is the future location of CPV’s Woodbridge Energy Center. When complete, this power plant will be an $845 million, 700 megawatt, natural gas-fueled, combined-cycle power generation facility. It is expected to generate enough electricity to power 700,000 homes. At the CPV site, attendees were able to see redevelopment in action, as the site is an active construction zone. Attendees were able to exit the buses and walk down to the Raritan River Wetlands portion of the property, where the public will have access to the Raritan River once redevelopment is complete. Construction managers spoke to attendees regarding redevelopment of the wetlands, and the success they have had in encouraging native species to return – including bald eagles! All attendees also received plants from Pinelands Nursery. The last tour stop was the General Dynamics site, which is currently being evaluated for redevelopment as apartment-style housing. Upon returning from the bus tour, attendees heard presentations from HMM’s Ellen Moore, James Snook, and Brian Clemson on ASTM Phase I changes, the LSRP program, and green infrastructure. Wanda Chin Monahan, Esq. then spoke on the importance of Planning, Preparation, and Professionals (the 3 “Ps”) in brownfield redevelopment. The program concluded with a panel discussion where attendees’ questions on brownfield redevelopment were asked and answered. The event provided insight into how all aspects of brownfield redevelopment, from start to finish, can be accomplished and lead to successful remediation, redevelopment, and economic development. Click here to watch the Woodbridge Brownfield Documentary. Click here to download the Woodbridge Brownfield Event Site Summary Handout. View photos from the Woodbridge Brownfield Event.